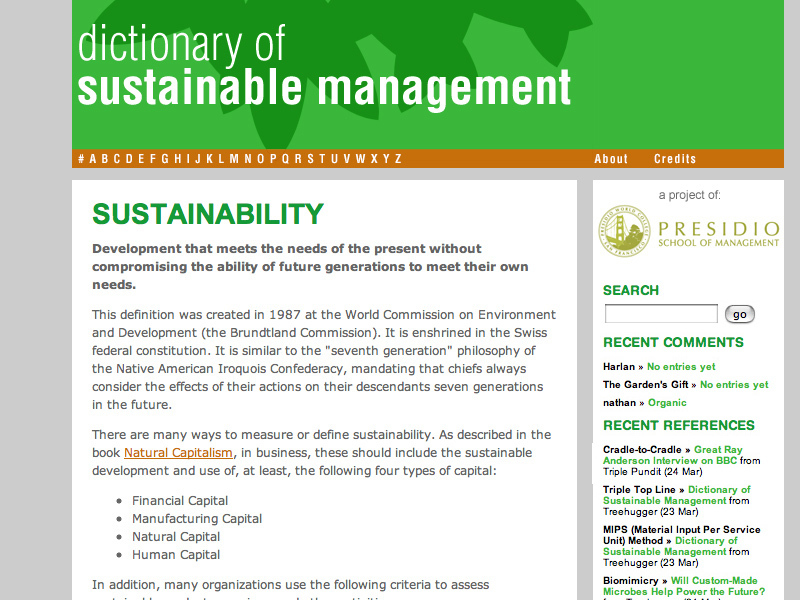 The Dictionary of Sustainable Management is an evolving dictionary for business leaders and students of sustainability and business-related terms. It is a project of the Presidio Graduate School. The purpose of this effort is to help people better understand how sustainability concepts are creating new understandings in the worlds of business, government, and society. I worked with four other colleagues from the Presidio Graduate School (we were all students together) to create this online dictionary of sustainability terms. We wrote the descriptions after consulting several experts, and I designed both the printed (paper) book and the website. The 2009 printed edition includes over 300 terms and definitions and 12 images. The online dictionary is open in that anyone can comment on any definition. Periodically, the creators of the dictionary compound comments into printed editions.